Etherton Events Presents CALIFORNIA MODERN with Mark Mussari, Ph.D.
May 19, 2017, Tucson, AZ: In conjunction with the current exhibition, Color Theory, featuring Tucson artists Kate Breakey, Andy Burgess and Gail Marcus-Orlen, Etherton Gallery is pleased to present a talk on CALIFORNIA MODERN — ART & ARCHITECTURE, given by Mark Mussari, Ph.D. at 7pm Friday, May 19, 2017. Mussari will discuss the development of California Modernism, which was transmitted through European trained industrial designers and architects. Following World War II the movement was regionalized through growth, individuality and reinvention. 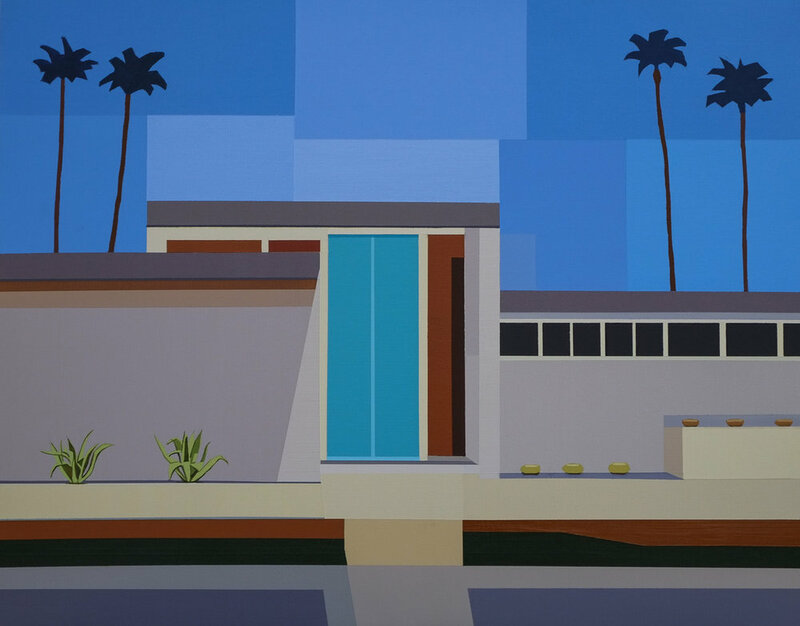 Unlike the machine-driven International Style, Modernism in California was infused with local culture, including Latin and Asian influences. Mark Mussari received his Ph.D. in Scandinavian Languages and Literature from the University of Washington in Seattle. He has written on art and design for both regional and national publications in scholarly journals and spoken at Modernism Week in Palm Springs, Phoenix and Tucson. His book Danish Modern: Between Art and Design was published by Bloomsbury Press in 2016. The evening will also include a brief presentation on Habitat for Humanity Tucson’s 2017 Rainbow Build Program. In 2005, Habitat for Humanity Tucson hosted the world’s first Rainbow Build — the first of Habitat International’s U.S. and international affiliates to do so! The idea spread like wildfire with Rainbow Builds now hosted in Washington D.C., Austin, Seattle, Ann Arbor, The Twin Cities, San Diego, and more. Tucson’s second Rainbow Build took place in 2012. These projects engage neighborhoods, corporations, businesses, organizations, and the LGBTQA community in Habitat Tucson’s mission to build strength and stability through shelter. COLOR THEORY will be on view at Etherton Gallery through May 31, 2017 at 135 S. 6th Ave in downtown Tucson. The exhibition features three Tucson artists whose use of color and design transforms their subjects into something utterly new. In conjunction with Color Theory, an installation of drawings by Albert Chamillard will be on view in the in-house pop-up. A destination for photography collectors since 1981, Etherton Gallery is known for its extensive inventory of classic and contemporary photography and works by emerging photographers expanding the medium in compelling ways. Our exhibitions consistently highlight the most important figures in the history of the medium and we remain dedicated to making great works of photography accessible to novices and experienced collectors alike. In support of our goal to champion the arts of the Southwest and in particular Tucson, the gallery exhibits top local and regional artists working in a variety of media, and regularly presents free exhibition programs that address related local and national issues. Etherton Gallery is a long-standing member of the Association of International Photography Art Dealers (AIPAD) and participates in fine art photography fairs including the AIPAD Photography Show, New York, Classic Photographs LA, and Paris Photo. Terry Etherton is an accredited member of the American Society of Appraisers and is available for appraisals, absentee bidding and collections consultation.